Tala, formerly Mkopo Rahisi, is a product of Inventure which was founded by Shivani Siroya who is also the current CEO. The service gives loans of upto Ksh. 50,000. To get a loan from the service, all you have to do is to download the Tala app on an Android phone you own. 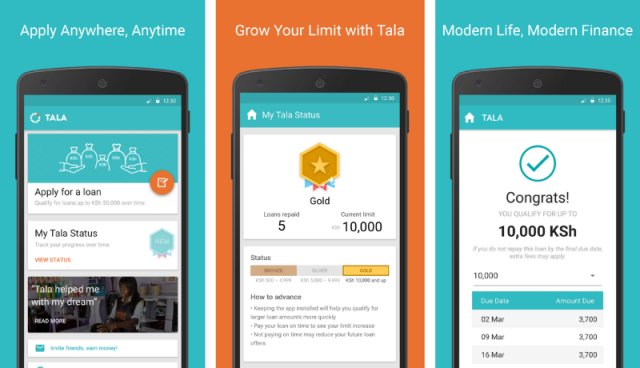 Only one Tala account can be associated with any Android phone. Afterwards you need to create an account and answers a few questions that will determine whether you can qualify for a loan or not. The service does further risk analysis by checking your M-Pesa transaction history. If you qualify to get the loan, you can choose to repay in two installments within a month or the full amount at the end of the month. Once your loan has been approved it is sent to your number via M-PESA. Loan repayments are also done via M-PESA (Paybill number 851900). The Tala interest rate is between 11% & 15%. Why am I not given loan and i paid my first loan on the expected date ? Apply now for personal and private loans and be assured that you will get the best services. Loans are granted 24 hours to clients worldwide. Kindly indicate your interest by contacting the foreign service manager. hae bona am not received feedback for my loan.